Not everyone is blessed with a perfect smile by the luck of their genetics. If you have always been unsatisfied with the way your smile looks and think that the ratio of gum and teeth that you’re showing off could use some improvement, crown lengthening is a procedure you should look into. Crown lengthening is a minor surgical procedure that specifically targets the front upper teeth to improve their health and appearance. 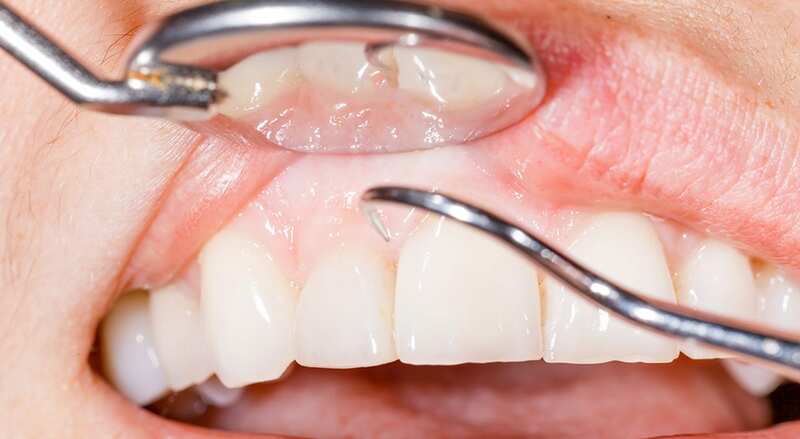 It involves a dentist, periodontist, or gum specialist removing a small amount of gum tissue from the upper ends of the teeth, exposing more of the crowns. In some cases, small areas of bone are also removed to achieve the desired results. As suggested by the name, crown lengthening usually involves reducing the amount of gum and increasing the area of teeth that your smile exposes, but it can also be performed to improve symmetry. While crown lengthening is primarily thought of as an aesthetic procedure designed to improve the way your smile looks, it can also have real health benefits. Exposing more of the roots of your teeth makes it easier to care for them, and it can help you prevent tooth decay by maintaining a thorough regimen of good dental hygiene. Crown lengthening is a highly effective procedure when performed by an experienced surgeon, but it is not the universal solution to an issue with a smile that is too gummy. You have other options to consider, including lip lengthening surgery and Botox treatment (for comparatively minor cases). It’s also possible that you do not have sufficient root length in your teeth for crown lengthening to make a significant difference. You should consult closely with your dentist or a cosmetic oral surgeon before you pick out any one procedure to resolve a gummy smile. A combination of techniques may actually be the right solution and that combination might or might not include crown lengthening. If you and your dental professional decide that crown lengthening is the way to go, you will be pleased to know that it is typically a very effective and uncomplicated procedure. Crown lengthening is performed under local anesthesia. The surgeon will first use small incisions to cut open the gum tissue above your teeth. Tissue will be removed and, if necessary, small portions of jawbone covering the crown. After all of the necessary tissues is out, your surgeon will rinse the area with saline and then suture the incisions closed. Recovering from crown lengthening typically takes one to two weeks. You can expect to be put on a prescription pain reliever and your dentist will advise you to apply ice if the affected tissue swells. You need to exercise care in how you brush your teeth until the stitches come out. Stitches are typically removed in about seven days after the surgery. Sticking to soft foods while you’re in recovery is generally a good idea. Although a gummy smile is hardly a life-threatening problem, it can be a terribly persistent one. Fortunately, you have a range of viable options, including crown lengthening that can help you deal with the issue. Consult your dentist for further details on this procedure and guidance on deciding whether or not it’s right for you. To speak with a dentist participating with Costa Rica Dental Guide, please fill out the “Help me Find a Dentist” form in the sidebar and mention your interest in crown solutions. A participating dental specialist will contact you to get you started on the road to a new healthy, beautiful mouth.